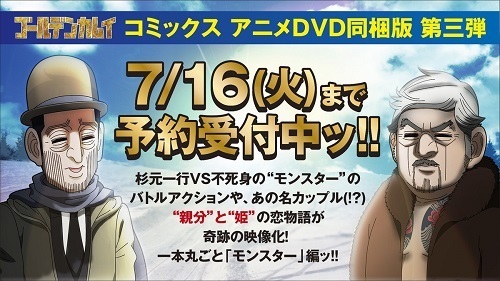 The official website for the Golden Kamuy TV anime series has announced that more OVA will be bundled in the 19th volume of the manga titled Monster-hen. The volume will be released on September 19. Golden Kamuy began its serialization via Young Jump magazine in August 2014. The 17th and latest compiled volume will be released on March 19, which will include a new OVA that will include stories "Koi wo shita kara Datsugoku suru Koto ni Shita" and "Kyoufu no Moudoku Dai Shitou! Hokkaido Okuchi ni Kyodai Hebi wa Sonzai shita!". The manga received two TV anime adaptations by Geno Studio, which aired last spring and last fall. First OVA, which bundled in the manga's 15th volume, was released on September 19 of last year. Oh, this is surprising! I was sure the franchise wouldn’t get any more anime adaptions but good to see more of it nevertheless! Hopefully, there is a 3rd Season in the making too! 15th issue of Young Jump magazine also revealed it. This is nice and all but I'm still crossing my fingers for another season at some point. Oh! Always great to see more from Golden Kamuy! Hopefully it can get a 3rd season, love this series! If they keep doing OVAs for sections of the manga they skipped in the anime then I really hope they do the Fake Ainu Village arc. It was disappointing that it was cut from the anime. There should be enough content in the manga right now since they just finished another big climax in the story, so hopefully this is a good sign for a 3rd anime season?